Perfect little lashes for reborn babies. Clear thread eyelashes have invisible thread. 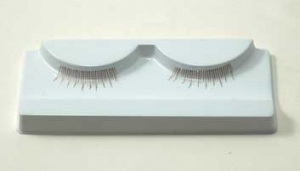 This means that these doll lashes can be applied directly to the doll's eyeball or eyelid, with glue that dries clear and all you will be able to see are the lashes, not the base thread that they are tied to. These are the best lashes for all size dolls and easy to apply. They curl up in a natural form and are easy to cut to size. Being clear thread they leave no unsightly thick lines when applied. Highly recommended.